HOW MUCH AIR DOES A BALLOON HOLD? Some one-man balloons hold 30,000 cubic feet. The largest holds over 800,000 cubic feet. The most popular size holds about 77,000 cubic feet and is about 70 feet high. WHAT IS THE ENVELOPE MADE FROM? Rip-stop nylon or dacron are the most common used fabrics. IS NYLON STRONG ENOUGH TO MAKE THE BALLOON SAFE? It would not be without the "load tapes" which run horizontally or vertically or diagonally and are made of the same material as seat belts. with plywood floors. Some older balloons have "gondolas" made of aluminum and fiberglass. HOW DO YOU CARRY THE FUEL? In stainless steel or aluminum tanks. These come in different sizes, the most popular of which hold 10 to 15 gallons. WHAT INSTRUMENTS DO BALLOONS USE? An altimeter to indicate altitude, a variometer to show whether it is going up or down, a compass to show directions, and a temperature gauge to tell how hot the air is at the top of the balloon. Each propane tank also has a fuel gauge. DO YOU NEED A RADIO IN A BALLOON? Most balloonists carry a radio. Some do not. A radio is required only in certain flying areas. DO BALLOONISTS CARRY PARACHUTES? Not usually. 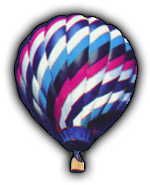 If the burner goes out and for some reason cannot be reignited, the balloon acts as a parachute and descends at parachute speed (about 17 feet per second). DO YOU CARRY OXYGEN WHEN FLYING? Not usually, since most flights take place at low altitudes. However if a flight above 10,000 is planned, oxygen is taken along. DO YOU NEED A LICENSE TO FLY A BALLOON? Yes. 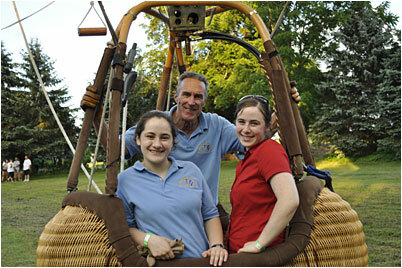 A balloon Pilot Certificate is issued by the Federal Aviation Administration. You must pass a FAA written exam, obtain a prescribed number of hours of instructions, make a solo flight and a flight to altitude, and pass a flight test. HOW OLD DO YOU HAVE TO BE TO FLY A BALLOON? To obtain a private Pilot Certificate you must be 16 years of old. And would you believe that there are balloonists flying in their 80's! HOW DO YOU INFLATE THE BALLOON? Usually a fan is used to blow cold air into the balloon. When about two-thirds full, the burner is used to heat the air. In the absence of a fan, cold air can be "flapped" into the envelope, but this is a difficult task. HOW DO YOU LIGHT THE BURNERS? With a striker similar to that used by welders to light their welding torches, or with an igniter. HOW MANY PEOPLE ARE NEEDED TO INFLATE A BALLOON? A Minimum of three, but preferably five or six, particularly if the wind is over 6 knots. HOW LONG DOES IT TAKE TO INFLATE AND DEFLATE AND PACK THE BALLOON? A good ground crew can inflate in about 15 or 25 minutes and deflate, stow and be on its way in half an hour or less. HOW MUCH CAN A BALLOON LIFT? It depends on how cold the air is and the size of the balloon. Balloons lift better in cold air than in warm air. The larger the air volume of the balloon, the more it can lift. WHEN DO YOU FLY? Usually soon after sunrise or just before dusk. At these times the air is usually most stable and there is less wind to contend with. With stable air conditions you can fly any time during the day but this is very unlikely. HOW FAST CAN YOU FLY? As fast as the wind is blowing. WHERE DO YOU FLY? Anywhere that the balloon can be launched from and where there are occasional open spaces to land. There are restrictions about flying over populated areas and airports. Power lines are not ideal places to fly near. CAN YOU FLY OVER WATER? Yes. The fuel tanks are buoyant and will keep the balloon afloat. And as long as the balloon is kept inflated you can also take off again. CAN A BALLOON FLY IN RAIN OR SNOW? Yes, as long as the visibility is good. HOW CAN YOU KEEP FROM GOING WHERE YOU DON'T WANT TO GO? If a pilot sees he is going in a direction he does not want to go, he can either ascend or descend to where the air movement is in another direction. But these directions usually do not change much at different altitudes. IS IT QUIET IN A BALLOON? When the burner is turned on it is quite noisy. When the burner is off it is very quiet. When aloft there is not even any wind noise since you are moving with the wind. but usually not over 5,000 feet. 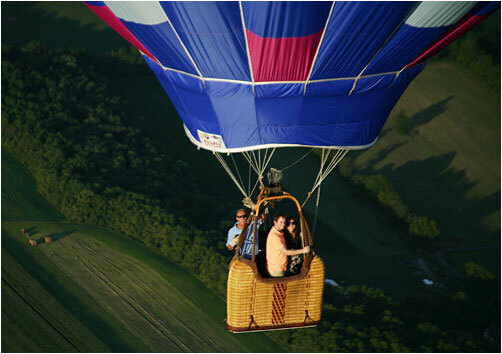 A typical flight would be just above tree top level in the country and over 1,000 feet or so in populated areas. IS IT COLD THE HIGHER YOU FLY? Temperature decreases about 3 degrees for every 1,000 feet of altitude. However, heat is given off by the burners and is continually radiated out of the balloon. Since you move with the wind you do not feel it blowing. DOES THE BASKET SWAY WHEN YOU'RE FLYING? No. It is quite stable and makes an ideal platform for taking pictures and sightseeing. CAN YOU SMOKE IN A HOT AIR BALLOON? Pilots do not permit smoking in their balloons because of the possibility of propane leaks. Smoking in hydrogen (gas) balloons is not permitted because of the danger of an explosion. WHAT HAPPENS IF TWO BALLOONS BUMP IN THE AIR? So long as only the envelopes touch, no damage is done. This is not considered dangerous. WHAT HAPPENS IF A BIRD FLIES INTO A BALLOON? It would likely bounce off! The envelope fabric is much tougher than it might appear. It is possible to fly a balloon with a hole large enough for a man to go through as long as the hole is not at the top of the envelope. WHAT HAPPENS IF YOU AND AN AIRPLANE ARE CONVERGING? Because balloons have so little control over their directions, they have the right of way over all other types of aircraft. WHEN YOU BURN OR TEAR THE BALLOON CAN YOU FIX IT? Minor burns or tears can be repaired with patches and a sewing machine. Major repairs must be done by a licensed FAA Mechanic with special equipment. DO BALLOONS WEAR OUT? If well taken care of, a balloon envelope should last 400 or more flying hours. HOW DO YOU GET BACK TO YOUR STARTING POINT? Since balloons can't be steered, it is seldom possible to fly back, so a chase crew follows along with a trailer or pick-up. HOW DOES A HOT AIR BALLOON DIFFER FROM A GAS BALLOON? 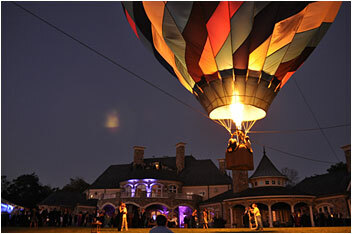 A Hot air balloon gets its lift from heating the air with propane fuel. A gas balloon gets its lift from lighter than air gases, usually helium or hydrogen. WERE BALLOONS REALLY USED DURING THE CIVIL WAR? Yes. Balloons filled with hydrogen were used by both the Confederate and Union armies for making observations. WERE BALLOONS POPULAR IN THE EARLY DAYS? Very much so. Ballooning so captured the imagination of the people of Europe in the 1800"s that it was reflected even in the style of women's dress. This is how the balloon sleeve and the hoop skirt originated. WHY DO BALLOONISTS CARRY CHAMPAGNE WITH THEM? 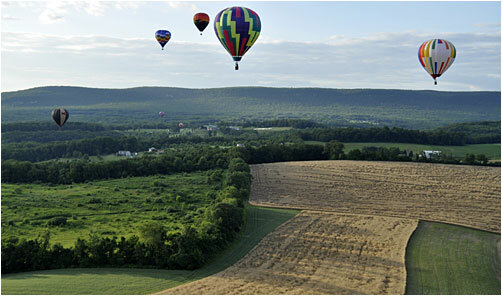 When ballooning began to become popular in France in the late 1700"s balloons often landed on farms. The farmers had never seen balloons and often attacked them with pitchforks. Balloonists found it to their advantage to carry champagne to pacify the landowner. Balloonists still follow this custom.